Fun-loving John and Mary Coates, just who were you? 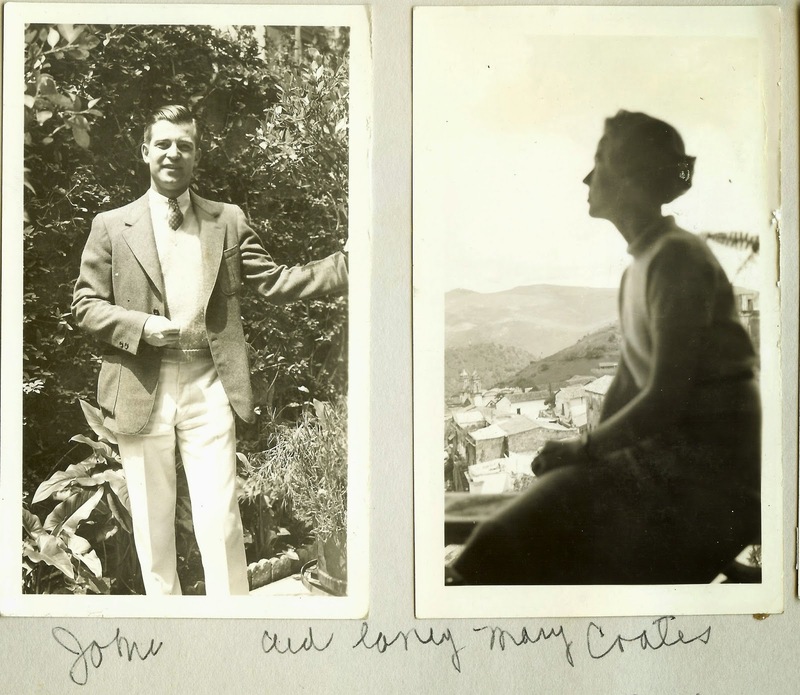 Caption reads, “John and lovely Mary Coates.” 1937, Mexico. Exact location unknown; possibly Taxco, Guerrero? From Benita (McGinnis) McCormick’s scrapbook. These photographs, from my great-aunt Benita’s scrapbook, tell us you were in Mexico in 1937. You either already knew my great-uncle and great-aunt, Phil and Benita McCormick, before you traveled there, or you met them while south of the border. I have tried to learn more about you, searching the usual genealogy sources, such as Ancestry.com, FamilySearch.org, and Mocavo.com, but the time frames and names don’t match up. Still, I have a few theories about you, so please bear with me as I share them here. Based on the note my great-aunt wrote under a photograph in which all of you were seated at a park fountain, you were American, but where were you from? If you knew the McCormicks before your trip, you might have come from either Illinois, Ohio, or Minnesota; otherwise, it’s anybody’s guess. Or maybe you were simply expats, living in Mexico. Whatever the case, it seems you and my relatives enjoyed one another immensely and spent a lot of time together. You even hired a guide to take you to various places, including the great Aztec pyramids of Teotihuacán, about 30 miles northeast of Mexico’s capital city. As I look at the picture of you and my relatives, I’d guess you were slightly younger than Phil and Benita McCormick. That would mean you were born sometime after 1900. 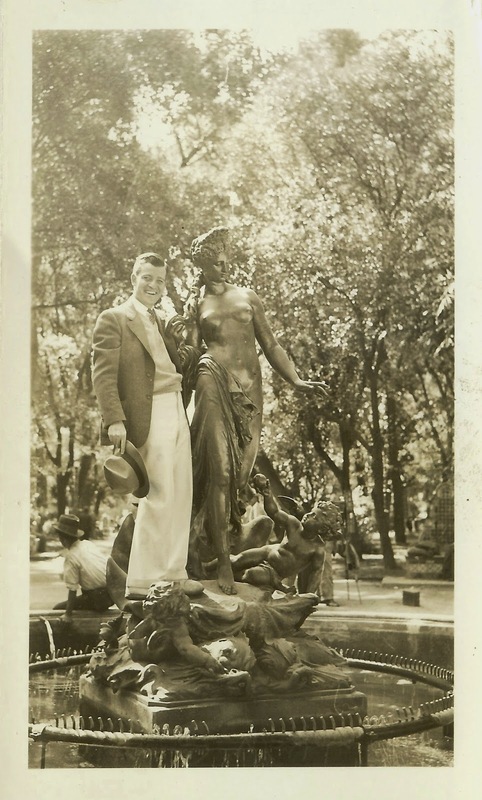 John Coates, hamming it up on a park fountain. John, you had the looks of a Hollywood movie star, with the character of a successful, self-assured, charismatic, and gregarious man who viewed life as a big adventure. 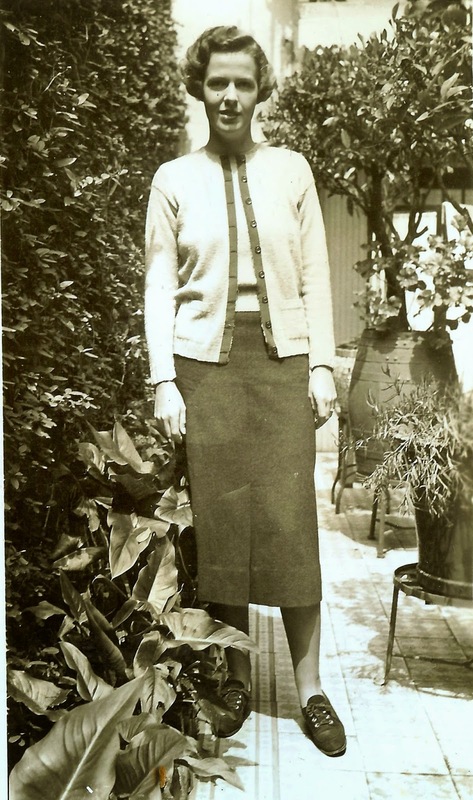 Mary, Aunt Detty described you as “lovely,” and you must have been that way inside and out. If a picture tells a thousand words, I think these photographs would say you were the counterpoint to your husband’s gregariousness. You seem outgoing, yet you also appear to be calm and poised and sweet. I’m sure Aunt Detty loved spending time with you, sharing insights and impressions of your sightseeing excursions, and discussing your families back home. Did you have children? If so, maybe they or someone else who knew and loved you will find you here one day and enjoy these snippets of happy times shared so many years ago. Maybe they will even share more with us, about you and your life together. In any case, if they do find you here, I hope they will be happy to know that your friendship with my wonderful relatives, whether brief or long-lived, was treasured and remembered and treasured long after those serendipitous days south of the border. Here’s to you, John and Mary Coates. Whoever you were, you were special to my great-aunt and uncle. And for now, that’s good enough for me. 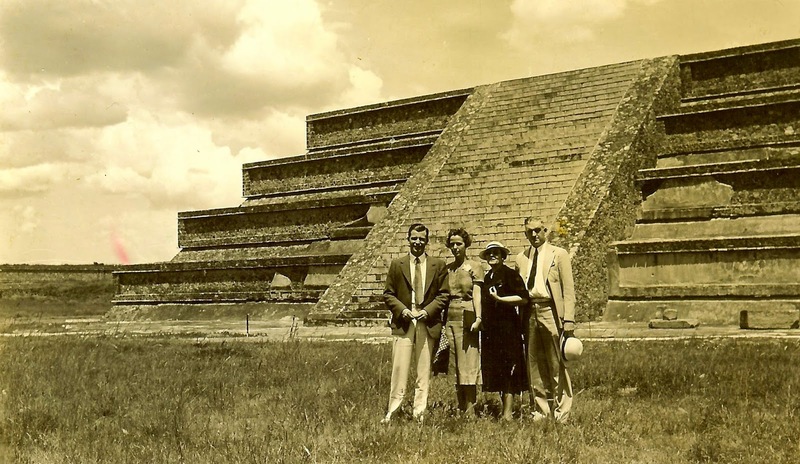 Left to right: John and Mary Coates, unidentified tour guide, and Benita and Phil McCormick. 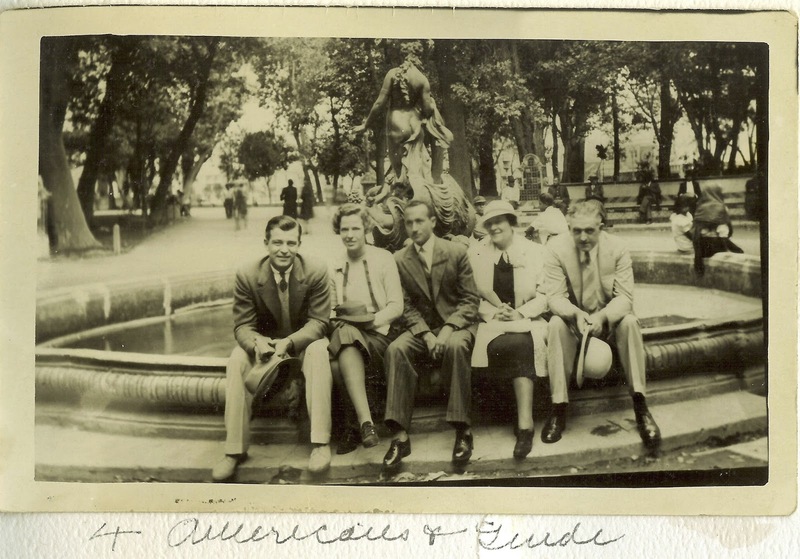 Caption reads, “4 Americans & Guide.” 1937, Mexico, exact location unknown. From Benita (McGinnis) McCormick’s scrapbook. Left to right: John and Mary Coates and Benita and Phil McCormick. 1937, Teotihuacán, Mexico. From Benita (McGinnis) McCormick’s scrapbook. What a sweet tribute, Linda. Seeing those photographs, I can understand why you'd want to know more about the relationship between this couple and your family. I hope someone from the Coates family has a serendipitous visit to Google sometime soon, which leads them to your (digital) door! Yes, wouldn't that be nice? I'm big on reuniting people with "lost" photos of their loved ones, and I'd love to see that happen here for John and Mary's family. Thanks for the kind words.